The DoingGroup's pyrolysis plant yield of oil from plastic is a high-temperature pyrolysis chemical reaction performed in an oxygen-free environment. This reaction can reduce the bulk of macromolecular compounds, waste plastics or other organic solids into small pieces. Molecular compound. Of course, in addition to waste plastics, you can use this pyrolysis plant to treat other organic solids, such as waste tires, waste rubber, and other organic solid waste. 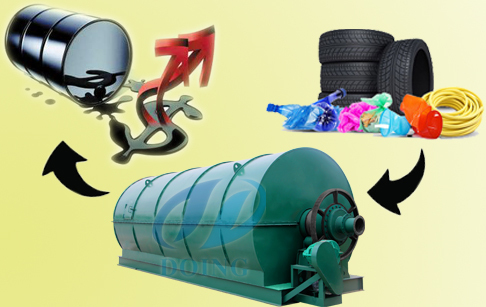 The Dongying Group has always been committed to the research and development of pyrolysis plant and has made its contribution to the industry second to none. With the maturity of the domestic market, DoingGroup has turned its sights around the world and established an office in Thailand. At the same time, we have The pyrolysis plant is also known and sought after by people in various countries around the world. 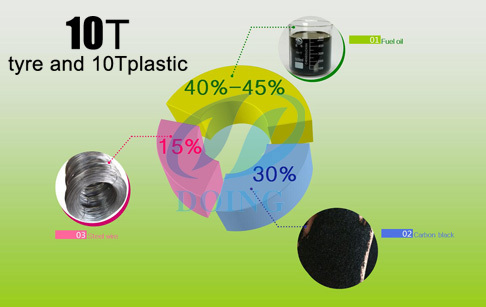 The DoingGroup's pyrolysis plant yield of oil from plastic is so popular because of its high oil output rate. Our equipment has different capacities. Taking 10 tons of equipment as an example, 4.5 tons of fuel can be obtained in one day of operation. 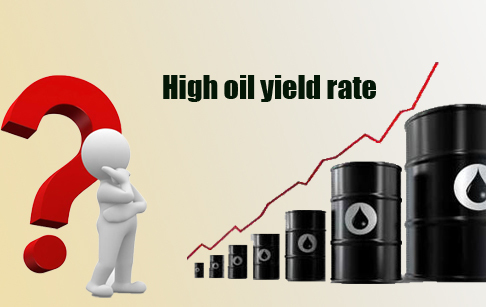 According to the conservative calculation of the value of fuel in the market, a day's worth of 1,800 dollars will be obtained for the fuel produced by the equipment. Of course, this benefit does not include carbon black and the income of steel wire. So why did the DoingGroup's pyrolysis plant yield of oil from plastic are so high? First of all, DoingGroup's waste plastic pyrolysis plant is designed with a vacuum device, which can provide negative pressure and drain oil and gas. This device ensures that even if the oil and gas are not fully condensed in the condensing system, they will pass through the pressure and be filtered again in the condensing system until the oil and gas are fully filtered. Second, use the most advanced and most effective condenser in the industry. This type of condenser uses column tube condensation, also known as a three-stage cooling system, which ensures that the cracked oil and gas is fully cooled and the oil yield is high. Finally, the DoingGroup's pyrolysis plant has oil-water separators. It not only can purify oil and gas, and separates water from oil and gas, but also can prevent the backflow of oil and gas and increase the oil yield. If you wanna to get more details about Pyrolysis plant yield of oil from plastic you can send E-mail to market@doinggroup.com. You can consult our professional engineer and specialized sales team with leave a message in below form.We will contact with you ASAP.You also can visit our factory in Henan,China.Get Detailed address.